This annotation previously appeared in Senses of Cinema, no. 1, Dec 1999. This essay first appeared in the Treasures from the French Embassy Collection monograph, published by the National Cinémathèque, 1998. Bad memories, welcome… you are my long lost youth. Always a reticent, fringe-dwelling, and independent figure within French cinema, Melville belongs to no particular time or movement. For all his Americanophile affectations, extraordinary knowledge of ’30s Hollywood minutiae (including his own Bazinian pantheon), and fascination with the gangster genre, he is still quintessentially a French film-maker, with avowed multiple influences upon the Nouvelle Vague (especially Godard and Truffaut). Despite his own often highly consistent and idiosyncratic style and dramatic preoccupations, Melville’s cinema is more difficult to encapsulate than is often suggested. L’Armeé des ombres is often regarded as of-a-piece with the gangster films (Le Deuxième Souffle , Le Samouraï , Le Cercle Rouge ) which surround it in his filmography, and yet, these evident but misleading correspondences tend to obscure the explicit specificity of the milieu depicted in the film, its faithfulness to and respect for the seminal Resistance novel by Joseph Kessel upon which it is based, the importance of elements of Melville’s own Resistance experience woven throughout, and the unusually heightened warmth and deep humanity that seeps into the chilly sounds and images that define the film. Essentially, Melville’s cinema is a highly complex and regulated thing within which nothing, not an edit, a gesture, a sound or a camera movement, is wasted (though it is often also stylistically adventurous). It is a curious entity, a self-conscious cinema that lacks self-consciousness. It is also a curious hybrid combining aspects of Cocteau, Bresson, Carne/Prevert, Huston and the gangster film, while at the same time producing a concomitant sense of restraint and withdrawal. Melville’s cinema is essentially tonal: a sensibility (melancholy, poetic, unhysterical) which is founded upon a ‘purity’ of style, performance and narrative action (which is like and yet remarkably different to Bresson). Some of the greatness of Melville’s later films can be found in this interpolation of a consistent, non-melodramatic, and almost abstract style with elliptical but quite classical dramatic structures. Unlike, say, Godard, Melville’s films are less pastiches or collages of other films and genres than slightly displaced but ‘fully’ formed examples of the cinemas they refer to (thus, L’Armeé des Ombres is still very much a war film, a Resistance film). Everything and yet nothing seems real in L’Armeé des Ombres. Even the extraordinary opening pre-credit shot of German soldiers marching along the Champs-Elysées startles because of its parallel sense of actuality (this did happen, is happening) and impossibility (how can one represent or return to the Occupation, how did Melville stage this shot?). The film’s dream-like, almost clandestine sense of geography, place and period sits alongside equally evocative but austere observations of the realistic minutiae of the Resistance movement. Throughout, it establishes a kind of memory world of isolation, intimate moments, and desperation, producing, in the process, an overwhelming sense of lived experience. One can literally feel time passing in L’Armeé des Ombres, as the cold, seasons, cultural stagnation and desperate actions of the characters are matched by the cinematography’s restricted tonal palette (all green, blue and grey). The sombreness of this representation is only broken briefly, but still never completely, in the sequence where Philippe (Lino Ventura) and Luc Jardie (the extraordinary Paul Meurisse) travel to London to visit De Gaulle. Here small pleasures, though for Melville formative and essential, such as going to the cinema take on an acute and personal poignancy. L’Armeé des Ombres is at once a highly personal (and this must be emphasised), non-naturalistic, dream-like fictional narrative and a kind of documentary (with a beautifully expressive low-key soundtrack). It combines an extraordinarily modulated and completely worked-out mise en scène with a melancholic, matter-of-fact, almost world-weary sensibility that has become Melville’s trademark (but which is extremely difficult to pinpoint exactly). Melville’s cinema is at heart paradoxical. This is evident less in the look and structure of the films themselves, which often seem so controlled and meticulously stylised, than within the worlds the characters find themselves trapped within. The central characters of L’Armeé des Ombres live by a necessary but abstract code, an unspoken and perhaps unspeakable mode of making sense of and reacting to the shadow world of occupied France. The impossibility of this code is underlined by the dramatic emphasis of the film, which focuses upon the inevitable betrayal between comrades rather than the positive outcomes of the characters’ essentially heroic work. For example, the film’s most sickening moment depicts, in almost ritualistic detail (though so far removed from the impersonality of much ritual in other respects), the bare-handed killing of a young informer. It is here, in the dirty detail and compromised heroism of the characters’ actions, that the extraordinary realism of the film lies. Everything, even the stifled protestations of the young informer, has a horrible muteness about it. It is difficult to imagine a death in the cinema that is more felt and less yearned for (an effect Tarantino has gamely strived for but not yet fully achieved). 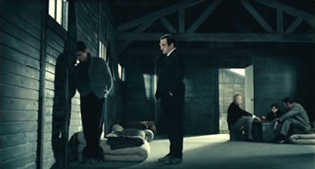 The characters of the film act within a social and cultural void which renders familiar French landscapes and iconography (the Metro, city streets, etc.) as Cocteau-like shadow worlds, and that frame an underworld that is reminiscent of but never reducible to that found in Melville’s gangster films. This type of stoic, joyless and strangely sacred ritual is for Melville’s characters a way of distancing themselves from the world, of maintaining an impossible purity or of simulating a rigorous professionalism. It is in the moments where this ritual, professionalism or purity breaks apart that the characters’ demise is prefigured or marked. Throughout, Melville eschews conventional character psychology and motivation, for example we never know precisely why particular individuals (particularly Simone Signoret’s seemingly unimpeachable Mathilde) inform on their comrades, and yet his handling of characters (including those who necessarily break these codes) still has a rare sense of balance and grace. Even the characters themselves seldom act out of malice, greed or justifiable revenge (or even out of clear-cut convictions), they simply respond to the contradictory and somewhat unreadable world that surrounds them. In the end, what one might take from L’Armeé des Ombres is a quietness, a solitude, a sense of time lived, and an understanding of a moment rendered opaque by the contested realm of history. It emerges as an unbearably moving reverie of the Resistance which is beyond romanticism and simple moral dichotomies. Alongside Melville’s first feature, the hauntingly poetic Le Silence de la Mer (1949), and Marcel Ophüls’ The Sorrow and the Pity (1969), it is perhaps the greatest cinematic testament to the lived experience of the French Resistance. L’Armeé des Ombres speaks the unspeakable in a tone which is at once grave and warm, and, in its final moments, when we are told the chilly fate of its characters, it achieves a kind of pure aphoristic poetry.